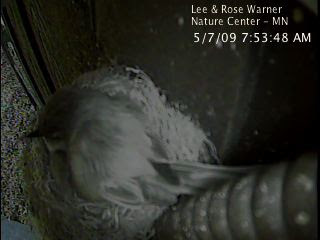 I came in to work early this morning expecting to see the fourth egg in the Eastern Phoebe nest and instead saw this. Momma bird was still on the nest. Was she still working on the egg? When Paul came into work I commented that she was still on the nest and he said he had seen a Brown-headed Cowbirds right by the nest in the morning. Brown-headed Cowbirds are brood parasites. They lay their eggs in other birds nests and then abandon the young to be raised by the foster parents. Was the phoebe staying on the nest because she saw the cowbird? 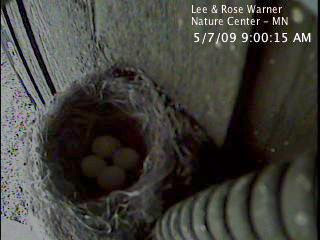 I checked again an hour or so later and the phoebe was gone but sure enough, day four and there is a fourth egg.